Solve fun food trivia! Collect chefs, ingredients and 1000 recipes! Travel the world! Can you discover them all?FEATURES:- QUIZZES: Solve food trivia to unlock chefs and ingredients!- INVENT: Combine ingredients to invent 1000 recipes!- TRAVEL: Send chefs to travel, collect postcards from famous places.- FILL YOUR KITCHEN: Collect hundreds of chefs, recipes, ingredients, decorations, trinkets and postcards! Can you find them all?DEVELOPER’S NOTES: – Chef Wars Journeys is free to play with ads and optional in-app purchases. Purchases are NOT needed to advance through the game. 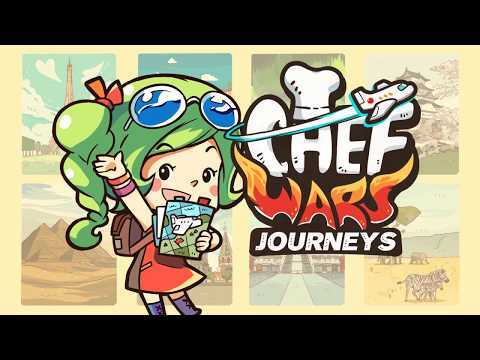 Ads, quests, and login rewards provide free gems to unlock additional hints and content.- The original Chef Wars is NOT needed to play – the gems and account from Chef Wars is not linked to this app. – We update the content regularly – more quizzes, recipes, and rooms!- The game is only available in English and Chinese. We hope to add more languages in the future.JOIN THE COMMUNITY!Facebook: http://www.facebook.com/mindcakegames/Twitter: http://twitter.com/mindcakesChef Wars Community: http://www.facebook.com/groups/chefwars/Having problems? Got a suggestion? We’re a small indie team and we’d love to hear from you! Reach us via social media or email: contact@mindcakegames.comStuck? Need hints? Check out the community wiki: http://chef-wars.wikia.com!